Summary: Advice for creating a loft, discussing the stairs and windows for a loft conversion. For a loft conversion to be deemed a habitable space, permanent stairs must be installed. Any conversion that can only be accessed by a loft ladder is not deemed a habitable space. To meet Building Regulations the stairs must enter the main stairwell on the second floor and be fitted with a handrail to aid evacuation in the event of a fire. Loft stairs can be constructed on site or manufactured to your specifications but in both cases accurate measurements are crucial as the stairs usually fit into tight spaces. Furthermore, the pitch of the stairs must not exceed 42°. Where there is no room to install a proper stairway, most local authority building control officers will consider other types of stirs, but only if the loft conversion creates a single room. To resolve access problems that a confined space can cause, a space saver staircase could provide the solution. This is a staircase that has alternating treads allowing you to get up a flight of stairs in approximately half the “going” distance – the horizontal distance between the face of the first and last risers – of a normal flight of stairs. A spiral staircase may seem to be the solution to limited space, but this could result in difficulties when trying to move furniture into the loft, so give the design of the stairs plenty of thought. Stair lighting should also be considered when designing the stairs. The position of the windows is another major consideration. Not only is it important to have enough windows fitted to ensure adequate daylight, their position and size are critical in providing a means of escape in the event of fire. 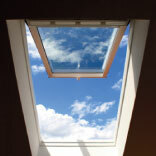 At least one window should allow access to the roof and have a minimum height and width of 450mm. The window sill must be between 600mm to 1100mm above the loft floor and not more than 1.7 metres above the eaves of the roof. 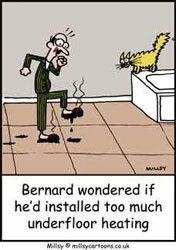 Once again it is a good idea to seek professional help on where to position the loft windows. Windows also provide ventilation to a loft conversion and whether you have rooflights or dormer windows fitted they should have trickle vents. Not only do trickle vents remove stale and humid air, they prevent the build up of excessive condensation in the roof void above a converted loft, which can cause timber decay.